#101 Basic Progressive Relaxation is easy to learn and a powerful place to start your exploration of relaxation strategies. Because of its simplicity it can be mastered quickly and called upon in many stressful situations. About 19 minutes in duration. Many people have experienced a form of this stress management. Its original origin comes from yogic practices that are thousands of years old, but this form is designed for the modern and Western oriented participant. This form is easy to learn, and so, easy to translate into real life situations. Basic Progressive relaxation is very good at bedtime for the relaxation that will help you to get a deeper and more restful state of sleep. #102 Autogenic Training Phrases are especially formulated phrases to develop control over your stress responses. This is a simple but sophisticated technique that offers mastery over systems that respond to stress. About 18 minutes duration. Autogenic Training Phrases have been very well researched. 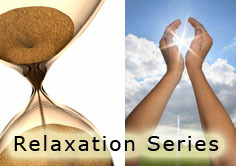 This technique has provided good results in working to reduce, if not eliminate, many physical and emotional stress related challenges. The stress caused conditions that have responded well to regular practice of Autogenics include: Migraine Headaches, High Blood Pressure, GI Complaints (Upset stomach, ulcers or pre-ulcerous conditions, constipation, diarrhea, colitis), panic/anxiety, sexual dysfunction (for both men and women), poor circulation to extremities, irregular heart beats, some hormonal imbalances, and can help the immune system function at a more ideal level. If you are taking medication for any stress related condition, it is advised that you consult your physician when beginning a program that includes Autogenics and biofeedback. Do not change your medication without discussing this with your doctor. Dr. Mason uses the Autogenic Training Phrases as his regular stress management technique.